But could you please give more explanation about these two dysfunction? I couldn't understand the first problem about rename because of language, and for the second zoom problem, is it for certain site or for all? Zoom button functions well from my side. Long time issue for this user. No one else (IIRC) is able to replicate the same problem with bookmarks on google as he has. 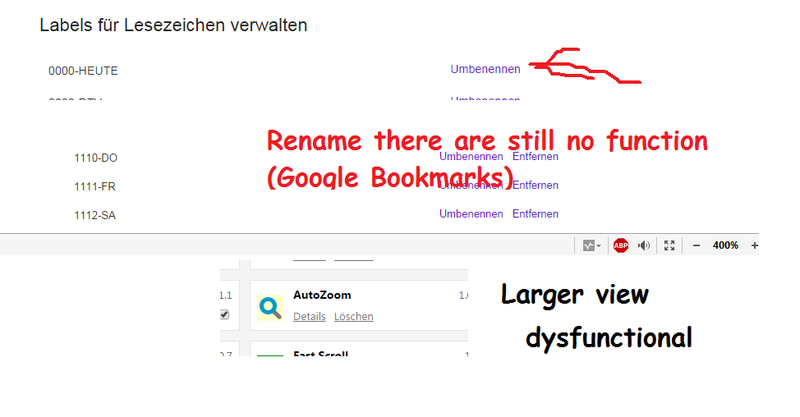 Zoom issue seems to be related to the extension shown.. not the built-in feature. That's why I still use mx4.9.2.600-beta because of the insinuation "No one else". Of all the users that have tested, you are the only one to have this issue. The maths and logic dictates it's a problem on your end. After going back reading through the linked thread i noticed that nowhere is it mentioned if you tested with ABP disabled (although it may have been implied with one response). Can you test with ABP off and see what happens. If this was a site error, it should happen to everyone. If this is a Maxthon issue, it should happen to everyone. If this is a userdata error, then it will only happen to the user. << this is where we're at now. If it's something else, then we need to narrow it down to what. Web WhatsApp not work on the menu right mouse button. All broken? As in the nothing works... Ok then!? How about some info on what the problem is so it can be resolved, rather that a pointless comment? facebook still constantly refreshing, passwords not filled in properly, hangs all the time, Takes ages to actually start . What sort of system are you running on? the constant refreshes, hangs and ages to start seems to be related to poor hardware rather than anything that MX is at fault of. Only issue i have with facebook is the page scrolling too far when using the mouse wheel at times. Otherwise, i have 1 tab on facebook open almost 24/7 while the PC is on and can't ever recall it refreshing when looking at it. Passwords issue - how about a link to a page where it doesn't work so we can have a look. It could just be a poorly coded site with stupid field names that MX doesn't like or work with. There's a known issue with some of the Microsoft sites logins that I recall... but not many others that i'm aware of. Yes, if you don't say then no one can help and try to find the cause and fix. The answer it seems is always either my hardware or try Mx 5. tried it hate it. Been a mx user since version 2 and seen it degrade with bloat since. That's understandable, but expecting a fix when there is no known cause isn't going to help. As stated, i don't have the issues - if MX was at fault then a significant number of users should be affected. Slow startup/crashes etc solely caused by the browser are rarely the case. There's generally an underlying issue. I would recommend MX5 as it's built on a newer core. Unless you don't like infobox or something else in it. But then that leaves your system/hardware or possibly some userdata or software conflict. Have you tried going through the troubleshooting thread? If you're moving on then that's your call. If not and you're going to put up with it, then 10mins to try and resolve the issue is much better than always dealing with the issues.